Two decades after the legendary Thoroughbred Man o′ War left his mark on racing history with his famous 20 victories in 21 races, the course of the Second World War was changed by the arrival of the North American P-51 Mustang in the air war over northern Europe. As Man o′ War is remembered above all the great horses that have thundered over American turf, so the mighty Mustang is celebrated as the overall finest piston-engine fighter of WWII and one of the greatest fighters of all time. How appropriately it was named for a wild steed! Perhaps no other creature on earth is endowed by God with such nobility, such proud and massive strength, such ability to stir the emotions and admiration of men as the horse. Through history the clash of arms has been accompanied by the galloping hooves of the fearless, charging warhorse. 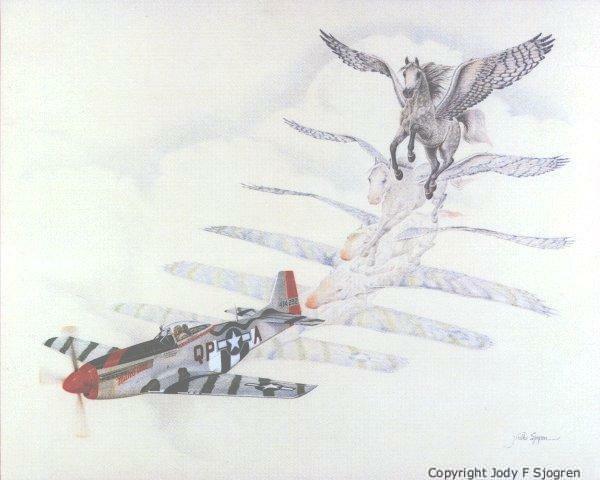 In Metamorphosis V: Man o′ War, artist Jody F. Sjogren expresses that symbolic association between the mythical winged horse and the intrepid interceptors which saved the Allied strategic bombing campaign from destruction by the Luftwaffe. This colorful P-51D was flown by fighter ace Lt. Col. Claiborne Kinnard during his command of the USAAF’s 4th Fighter Group. Metamorphosis V: Man o′ War is a tribute to the P-51 Mustang and to all the brave men of war whose courage and flying skill helped bring about the Allied victory in World War II.